Currently, you can broadly look at all Twitter users or your own Twitter account’s followers and your organic audience. What’s the difference? When someone retweets you, their followers – who may not be your followers – are counted in your organic audience. The reason that I was interested in this definition is because, for the "Interests" category, my followers and my organic audience are significantly different. In essence, while my followers are a tech crowd, the people who actually see my tweets are more interest in politics, business, and comedy (?) than tech. Sadly, neither my followers nor my organic audience is significantly interested in music, which makes it a bit harder to hawk my Ontario Emperor album "Salad." On controlled obsolescence - compatibility doesn't have to be hard - or does it? Over the weekend, Dave Winer shared a post that Peter N. M. Hansteen wrote in 2013. The title of Hansteen's post? "Compatibility Is Hard." Specifically, Hansteen was discussing the lack of compatibility between different versions of Microsoft Word. He found a Word file that had been created in 1989, and was unable to open it using a 2003 version of the program. What happened? Between 1989 and 2003, someone at Microsoft decided that it was not worthwhile to support the 1989 file format. After all, there are costs to supporting multiple platforms, or operating systems, or web browsers. For every previous version of an application, browser, or operating system that you support, you increase the planning time, coding time, testing time, and several other costly times. But what if you just freeze the format? Some of you are laughing now. So we'd use a web browser that doesn't support modern security strategies? Or use synth sounds that date from 1991? We still get a lot of interop with the OPML format, designed in 2000, 17 years ago. And RSS 2.0 was frozen in 2002, 15 years go. Still going strong. So if interop is a priority and you are a hardass about it, as I am, you can have it for a long time. So it looks like you have two choices - either evolve your offering and break things, or keep your offering static with no innovation. Let me propose a third ground - controlled obsolescence, for lack of a better term. I have frequently talked about the ANSI/NIST-ITL standard for exchanging biometric data. This standard has been around in one form or another for a very long time - in fact, the first version (1986) came out before the National Institute of Standards and Technology even existed. (It was the National Bureau of Standards in those days.) Since that time, new versions have come out every few years. As I write this, the current version of the standard is ANSI/ NIST-ITL 1-2011:Update 2015. There have been a lot of changes between 1986 and 2015. Most of these changes have been additions of functionality. Back in 1986, the standard had no way to support irises or DNA; today those types of data can be exchanged. Other additions have been in format; back in 1986, there was no way to change data via the use of XML; now you can. But some of these changes have been SUBTRACTIONS of functionality. If you look at Table 3 in the aforementioned 2015 update of the 2011 standard, you'll see a listing of all of the record "types" that are supported by the 2015 update...and some that aren't. Yup, that's right. If you have some software that generates a NIST record in accordance with the 1993 version of the standard, and that NIST record has Type 3 data, or Type 5 data, or Type 6 data...and if you then send that NIST record to some software that supports the 2015 update to the 2011 standard...THE NEW SOFTWARE WON'T BE ABLE TO READ IT. So why doesn't the Peter N. M. Hansteen of the biometric world complain about the time that he found a low-resolution binary grayscale record, or a low-resolution or high-resolution (500 pixels per inch!) binary image record, and his new software wasn't able to read it? Because the Peter N. M. Hansteens of the biometric world actually had a say in deprecating Type-3, Type-5, and Type-6 records. When someone at Microsoft decided that the 2003 version of Microsoft Word didn't need to open 1989 files, that was that. Microsoft didn't poll all of its customers to see if they were OK with removing 1989 compatibility. The evolution of the biometric standards is a bit different. If you look at any of the ANSI/NIST-ITL standards, you can see a list of people who were consulted regarding changes to the standard, and the organizations that they represented. For the 2015 update, dozens of people were contacted - not just in NIST, and not just with the biometric vendors, but with a number of agencies that depended upon the standard. Jeffrey Carlyle of the FBI was consulted. Charles Schaeffer of the Florida Department of Law Enforcement (FDLE) was consulted. Mark Labonte of the Royal Canadian Mounted Police was consulted. So all of these people, including vendor representatives such as Peter Lo and John Dowden, were all very aware of what was in the standard, and what had been taken out. In fact, some of these same people were around in 2011 when Types 3, 5, and 6 were yanked from the standard. I have no idea what the internal discussions were like, but my guess is that all of these people were in agreement that these three types were not needed any more. I'd be willing to bet that absolutely nobody was sending Type-5 records to FDLE in 2011. So here's the question - how often can people execute this balancing act between keeping standard compatibility while still advancing the standard? And how often can the stakeholders reach agreement on controlled obsolescence? In the aftermath of the United brouhaha, there's been some comment that United has failed to put its customers first. But guess what? One noted businessman has proclaimed that his customers are not first - his employees are first. But does United's decision to give boarding priority to its employees on a Chicago - Louisville flight indicate that Richard Branson is in complete agreement with the move? It should go without saying, if the person who works at your company is 100 percent proud of the brand and you give them the tools to do a good job and they are treated well, they're going to be happy. This is not exactly the same as "giving employees priority over paying customers in all instances." Are United employees 100 percent proud of the brand? Undoubtedly some are, but there are probably some who would not dare announce in a public gathering who their employer is. Do United employees have the tools to do a good job? That's debatable. As one of my friends noted, the whole fracas could have been avoided if United had just loaded the four employees into a limo and sent the limo to Louisville (which isn't that far away from Chicago, relatively speaking). Are United employees treated well? I'll give them credit on this one. In his original statement to employees, Oscar Munoz literally stood behind them. Our employees followed established procedures for dealing with situations like this. While I deeply regret this situation arose, I also emphatically stand behind all of you, and I want to commend you for continuing to go above and beyond to ensure we fly right. So I signed up for a 28 day "stress reduction" challenge, because I certainly could use some stress reduction techniques. Plus, if you amass 700 points over the 28 days, you get a small financial reward. To earn points you do things such as get enough sleep (you can track this), participate in a hobby, and refrain from consuming caffeine after 3:00 pm. For the first ten days I dutifully logged my points for the things that I was doing, and tried a couple of new things, but not many. Day in and day out, I logged stuff. By mid-afternoon of day 10, I realized that I was NOT on track to earn the 700 points. Therefore, why bother tracking? So I celebrated my liberation from stress reduction by going to the Flavia machine, making a hot chocolate, and adding a shot of espresso. Despite the fact that it was 3:05 pm. I wasn't going to stress out about it. P.S. The morning after I effectively quit the stress reduction challenge, one of my financial institutions completely botched a travel notification. Guess I shouldn't have had that shot of espresso after all. So tonight, I heard a constant beeping in the kitchen and went to investigate. Our oven was asking us to enter the probe temperature. As my wife was wondering what was going on, I assured her that I was the expert in oven temperature probe issues. But by the time I looked up my 2009 post and was about ready to search for a hair dryer, the beeping stopped. Not sure why it happened, since we didn't even use the oven today. Maybe our oven was showing solidarity with other ovens that DID cook an Easter dinner. 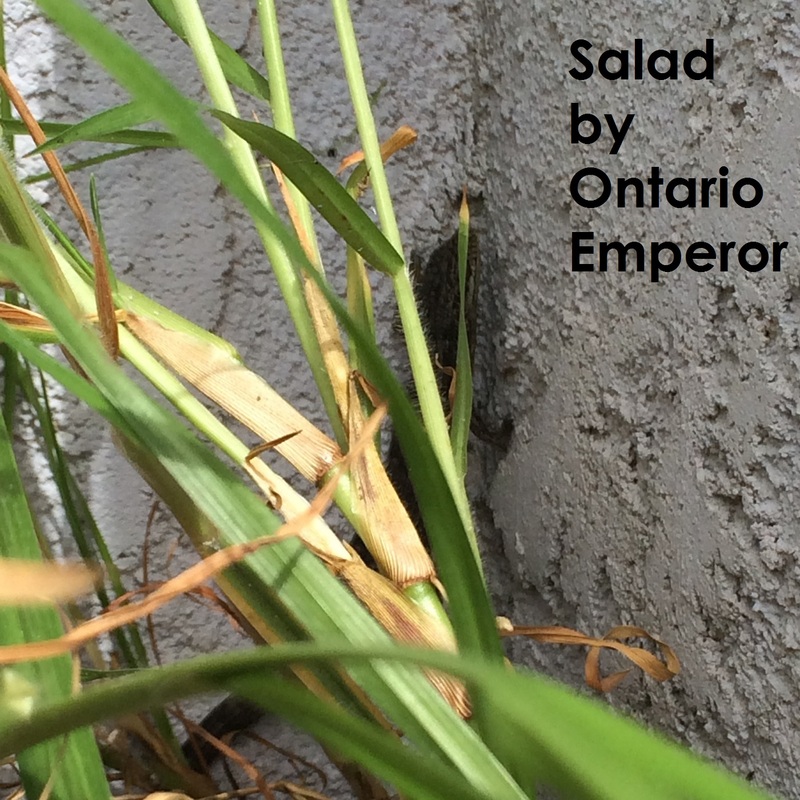 Why you will soon see a formal press release for Ontario Emperor's "Salad"
If you saw my post from earlier today, you know that early on Saturday morning - approximately 4:30 am Eastern Daylight Time - I submitted a press release to PR.com for approval. Well, I just received this in my email. So in this instance, my free press release was approved approximately 18 hours after I submitted it, and it is now in the queue to be formally released early Monday morning. Well, my press release may or may not get traction similar to the paid press release that ObservaMé released earlier today (Saturday). This press release showed up at a variety of sources. OK, it didn't make Elle or Men's Health, but you can see it on Benzinga, SAT PR News, and some other sites. I don't think that the Ontario Emperor press release will land me on the cover of the Rolling Stone, but I'm curious to see where it does end up. Of course, this is just a small part of a marketing campaign. If "Salad" were on physical media, I'd be ringing up Rhino Records and doing what I was doing in the late 1980s with my Shuffleboard! zine. Why you haven't seen a formal press release for Ontario Emperor's "Salad"
A little over a decade ago, one of my coworkers at Motorola got extremely disenchanted with all of the Fortune 500 corporate red tape. So he left Motorola and started his own company where he could do things the way that he wanted to do them. His new business competed against Motorola, and still competes today against my current employer MorphoTrak. Obviously I have no insight into this competitor's financial situation, but the fact that he's been going at it for this long indicates that he's doing something right. In the course of doing business, my former coworker found the need to issue press releases. Here's the first one that he issued, back in 2008. He didn't use PR Newswire or any of the big boys for his press releases; he used a much smaller company called PR.com. This allowed him to get the word out about his company's products and services. Fast forward to 2017, and I've been working on my side project. As I wrapped up the last song for the Ontario Emperor album "Salad," I had to think about how I was going to publicize the release. Obviously I have social media capabilities that weren't really available in 2008, but I began thinking about issuing a press release also. So I thought, "Why not use the PR outlet that Edward used for his company?" After all, they do have a free tier, where if you adhere to certain restrictions, they'll host and issue your press release for free. "It's been a while since I've released a full-length album," said the marketing flack who is pretending to speak for Ontario Emperor. There's some more of that in my press release, along with the not-flattering history of previous Ontario Emperor releases. Basically, every website that has hosted Ontario Emperor music (mp3.com, GeoCities, last.fm) has either closed down or has shuttered critical features. I guess I'm the curse of musical websites. Sorry in advance, Bandcamp. So it was early Saturday morning, my press release was finished, and I was just waiting on PR.com approval. Every few minutes I'd recheck the PR.com website to see if my press release was approved, until I realized that even if PR.com has people working in India on Saturday afternoon India time, they probably don't have people reviewing press releases within five minutes - especially since I haven't paid them a single penny to issue the press release. So I started by issuing the press release via my own devices - namely, my Empoprise-MU music blog. And because it was on my own blog, rather than PR.com, I was not only able to insert a picture of the album cover (something that would cost extra money on PR.com) and use real clickable links (something that would cost extra money on PR.com), but I was also able to embed a player to play the album tracks themselves (I don't even know if I can do this on PR.com). The Ontario Emperor page on Facebook. Other Facebook pages, including those for Empoprise-MU (my general music page on Facebook), Empoprise-BI (this is, after all, a business), and Empoprise-IE (since every single track on "Salad" was recorded in the Inland Empire). The Empoprises Public Community on Google Plus. My personal Google Plus account. And, last but not least, the Empoprise-BI business blog itself - via the post that you are reading right now. Meanwhile, I'm still waiting on PR.com for approval. And when (if) I finally get it, I'm not sure how effective it will be. But hey, I had fun writing the thing. P.S. Now, because I care, here's a shameless reprint of the entire press release that I already posted on Empoprise-MU a little over twelve hours ago. Empoprises announces that musical artist Ontario Emperor has released his first full-length album in over 17 years. 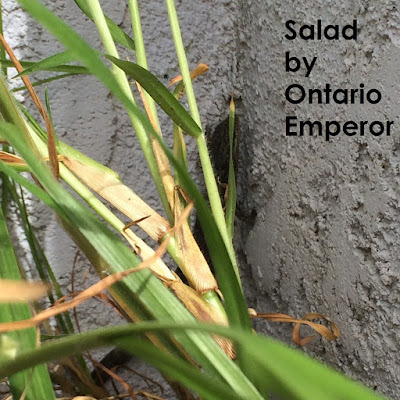 The ten-song album, "Salad," is available electronically on the "ontarioemperor" page at Bandcamp (ontarioemperor.bandcamp.com). Ontario Emperor's music was originally released on mp3.com in 1999 and 2000, including the full-length album "Digital Judge" that was released in November 1999. After mp3.com ceased operations, Ontario Emperor released a free track on GeoCities. After GeoCities ceased operations, Ontario Emperor released a free collection of songs on last.fm. After last.fm ceased hosting music files, it was on to Bandcamp, where the song "Bare Plate" was released last month. "It's been a while since I've released a full-length album," said the marketing flack who is pretending to speak for Ontario Emperor. "I'm happy that 'Salad' is finally available, and those who love melodic synthetica will enjoy the songs on this album." The marketing flack also put words in the mouth of John E. Bredehoft of Empoprises. "Empoprises has been primarily known for textual content, but we are happy to be associated with musical content also." The ten songs can be previewed on Bandcamp. Purchase of the album, or of selected individual songs, allows unlimited streaming as well as download of the song files. Some time last year, I ... tried to re-access a ... service that listed government business opportunities. I ran into hassles and dropped the matter until now. I knew my login name for the service, but could not recall the password. I tried a number of possible passwords, none of which worked. So I went to the service's reset password option, which would email me procedures to reset my password. I would receive that email within a few minutes. I never received the email. So why haven't [I] created a new account with a new user name for this particular service? Because of the sentence at the end of the support email. "Passwords must be changed every 90 days or your account will be disabled." As I've previously noted, others - most notably a (presumably now former) Federal Trade Commission official - think that 90 day password expiration policies are useless and dangerous. So I never set up that account in 2016, but I did set up that account in 2017 because I had to. How long ago did I set it up? Oh, about 80 days ago. So you can guess the email that I recently received. Yup, time to change my password. When I went to the website in question, I was kinda sorta curious about WHY I had to change my password every 90 days, and perform all of the other rigamarole associated with this. It turns out that I - and you - have to go through this hassle because GSA Order CIO P2100.1 says so. So what's GSA Order CIO P2100.1? I found a link to it here, downloaded the PDF from the link, and found the applicable section. This chapter provides the basic technical control security policy statements for GSA systems. Technical Controls provide specific guidance on security controls and technical procedures used to protect GSA IT resources. The policy statements are derived primarily from OMB Circular A-130 and are integral to an effective IT security program. The manner in which these controls are implemented depends on the risks, sensitivity, and criticality associated with the specific systems and data involved. In some cases, basic security policy controls may need to be modified or supplemented in order to address application-specific or system-specific requirements. The following paragraphs provide specific policy on controls for identification and authentication, access control, auditing, and others. a. Authentication schemes must include multifactors using two or more types of identity credentials (e.g. passwords, SAML 2.0 biometrics, tokens, smart cards, one time passwords) as approved by the Authorizing Official and in accordance with the security requirements in the subparagraphs of this paragraph. (1) Passwords must contain a minimum of eight (8) characters which include a combination of letters, numbers, and special characters. Accounts used to access Federal Desktop Core Configurtion (USGB) compliant workstations (i.e. Windows XP and Windows Vista) must contain a minimum of sixteen (16) characters but do not have to contain a combination of letters, numbers, and special characters. (2) Information systems must be designed to require passwords to be changed every 90 days. So now the question is, WHY does GSA Order CIO P2100.1, Section 5, Paragraph 1.b. (2) require me - and you - to change our passwords every 90 days? Well, it seems like this is because OMB Circular A-130 says so. So I began to search for OMB Circular A-130 - which was a bit difficult because since the OMB is effectively part of the White House organization, the whole website was jettisoned on January 20, 2017 when we got a new President. However, the old information was preserved at a site called obamawhitehouse.archives.gov, and that's where I found this page dated July 27, 2016. The Circular can be previewed HERE and is effective July 28, 2016. So I clicked on both of the links...but I didn't get OMB Circular A-130. Instead, I got a PDF ANNOUNCEMENT about OMB Circular A-130's availability. I then searched https://www.whitehouse.gov/omb, but couldn't find the elusive document. But I did change my password on the original subject website. I won't tell you the language that I used in the new password, but suffice it to say that the service would not want to hear me speak it out loud. Good news from the ISC West show in Las Vegas that I am attending today. I just took a quick first pass through the 1000 or so booths, and only noticed one that employed booth babes. Subsequently I spotted another one, but the first booth really...um...stood out. In the private discussion of this post on the IPVM discussion board (the post itself is public), there seems to be a division between "this is unacceptable" and "you're making a big deal out of nothing." In other words, what happens in Vegas stays in Vegas. And that seems true of this case. If you check the company's LinkedIn posts, which include several posts about ISC West, the booth babes somehow didn't make it into the pictures. Here's an example; insert your own "Executive's Club Tour" joke here. It's quite possible that the company's employees, working away at the office in the northeastern United States, have no idea how their company is being marketed in Vegas. Which raises the question that was posted on Honovich's board - how do you know that the women handing out bags AREN'T employees of the company? At Rapid Response, our technology is extremely advanced and comprehensive, and our people are the most highly qualified and extensively trained in the industry. Employees are SIA-certified regardless of their current role. Technical Support personnel must have at least 15 years experience in the industry; most have over 20. Dealer Support Account Executives are all former Central Station Specialists, many having served on specialized teams or having held managerial or supervisory positions. Our people undergo stringent screening, rigorous training, and then ongoing education to consistently improve and update skills. I think that I can authoritatively say that the women with buxom cleavage and short skirts didn't have 20 years experience in the industry. Exemplary business and professional ethics, a strong sense of urgency, results orientation, excellent presentation and written skills accompanied by astute financial and business acumen have earned me the respect of my clients, and colleagues. OK, I'll give him a 10 on the presentation skills. But I'm not sure about the business acumen. While I often write about technology, I realize that technology in and of itself is meaningless. Technology is only meaningful if it makes a difference in the lives of a group of people. As I am fond of noting, the technologies that are developed for law enforcement applications are not useful unless you have dedicated police officers who seek to use them for the public good. When a technology is credited with solving a decades-old cold case, the truth is that a police officer successfully used the technology - perhaps after several instances of trial and error - to solve the case. But that really doesn't have anything to do with Magic Leap and its patent applications. Before we get to that, though, let's go back to May 2013. Larry Page, who was CEO of Google at the time, was appearing at Google I/O when he was approached by Robert Scoble. 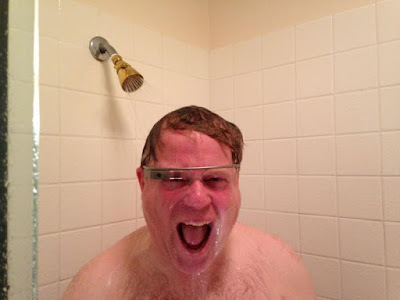 Page jokingly (maybe) said to Scoble, "Robert, I really didn't appreciate the shower photo." Yes, life. Because Google Glass - at least as a consumer product - is dead. Time will tell whether Google Glass is/was a Lisa that led to the Mac, or if it was an Amiga that led to nothing. Or if it's yet another example of Google introducing a product and then killing it. A description of the picture is found in paragraph  of the patent application. The short version is that Google Glass and other existing devices at the time of the application "fail to address some of the fundamental aspects of the human perception system." But that isn't why Google Glass failed. Google Glass failed because there wasn't a consumer market for it. UPDATE April 2017: I still am hearing good things about Magic Leap. The next couple of years are gonna see a ton of new mixed reality glasses for us to try. I'm going to tell this story backwards. The entire "Friday Foster" movie can (as of now) be found on YouTube, although I'm not THAT dedicated to my privacy to watch the whole thing. One of the roles in that movie, Gate Guard, is played by Mel Carter. The danged role doesn't even have a name. And if you check IMDB's verified full cast and crew for this movie, Carter's role is the last one listed. The role is just fleetingly mentioned in Carter's Wikipedia biography. Of course, if you check my last.fm stats for Monday April 3, you'll see that I listened a lot to Carter's most well-known work, the song "Hold Me, Thrill Me, Kiss Me." It turns out that this WAS a song that I've heard before. And you've probably heard it also. The song was number 14 on Billboard's Year-End Hot 100 Singles of 1965. The number five song in the year-end hot 100, "You've Lost That Lovin' Feeling," is one that I know well (both in the 1965 version and in the Human League's subsequent cold, detached version). But why was I initially interested in the #5 song of 1965? Or the #14 song? Or an obscure blaxploitation film? Well, because it was all an attempt to manually obfuscate my search data. Now that I've expressed great interest in Mel Carter's minor role in a 1970s blaxploitation flick, all of the search engine companies and ISPs will be at least a little bit confused about my real interests. But why do this manually? The problem with these tools and strategies—which are undoubtedly well-intentioned—is that it’s actually pretty hard to generate convincingly realistic-looking noise. After all, most of our online searching doesn’t happen on a rigorously timed schedule of one search every 10 seconds. Dan Schultz, a programmer...[created] a tool called Internet Noise to help people seed their online activity with “noise,” or random web searches and sites that obscure their true browsing habits.